Sabra And Chatila -An extract from the testimony of two American journalists to the International Commission of Inquiry. One of the most horrible atrocities in recent history is the genocide (as dubbed by the United Nations) of Palestinian refugees at Sabra and Chatila in 1982. This massacre goes largely ignored by much of western media, even though it compares greatly to their own tragic event of terrorism, 9/11. Israel had secured an alliance with the Lebanese Phalangists and planned this operation to coerce the exodus of Palestinian refugees from Lebanon. After an attempted assassination of Israeli Ambassador Argov, Israel invaded Lebanon as part of their “Operation Peace For Galilee.” They surrounded PLO camps in west Beirut. A cease-fire was negotiated by US Envoy Phillip Habib, and consequently the PLO were evacuated, leaving behind the elderly, women and children. Israeli reports claim 350 were killed, 90% of them men who died quickly via machine gunning. An actual count reveals 3297 killed in total, 1097 in the Gaza hospital, 400 in the Akka hospital (hospitals inside the camps) and 1800 in the streets of the camps. Numbers of the victims is uncertain between sources as a number were buried in mass graves which cannot be opened as Lebanese authority forbids it, many were buried under ruins of houses and many were taken alive to an unknown destination but never returned. SIS states that survivors said the murders were first committed with soundless weapons such as axes, knives and other such tools at first. Some were buried alive with bulldozers and women raped and beaten. Doctors, nurses and patients in the hospitals were murdered and Palestinians were lined up and shot without discrimination, whether male, female or child. 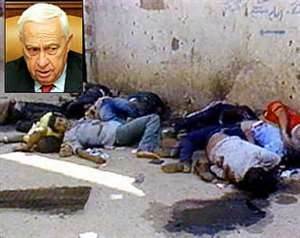 Victims of the massacre and survivors were never deemed entitled to formal investigation and although Ariel Sharon, who commanded the attack and is held responsible, was labelled a war criminal for it, he was never tried for those crimes. This genocide, unlike 9/11, went unpunished. There was a protest afterwards of 400,000 Israelis who took to the streets and Sharon subsequently resigned from his position as Minister of Defense and instead remained in cabinet without a title. He later went on to become Prime Minister of Israel. Lebanon's Christian President-elect, Bashir Gemayel, is assassinated by a pro-Syrian militant but his loyalists blame the Palestinians. 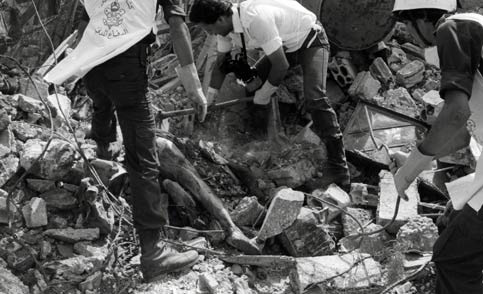 This week marks the 26th anniversary of the Sabra and Shatila massacre, one of the bloodiest events of the second half of the twentieth century. A Google search for recent news reports on this year’s commemoration of the atrocity, however, brought up very little. Yes, there were some emotional blog posts, as well as a link to the BBC’s “On this Day” page, featuring quick facts and figures about the massacre, alongside an archival, and iconic, photograph of twisted corpses lying in a heap next to a cinderblock wall, the victims of an execution-style killing. It has been more than a quarter of a century since more than 1,000 unarmed men, women, and children were raped, maimed and slaughtered. The massacre occurred at the dividing point of the 1975-1990 Lebanese war. Some might say that the killings were the marker or the catalyst of the war’s horrible turning point. Before the Israeli invasion of Lebanon and siege of Beirut in the summer of 1982, the Lebanese civil war had taken many lives and introduced new images and phrases into the Arabic and English languages. The Lebanese war involved many players and funders, not all of them local. But with the entry of the Israeli army and air force, Lebanon witnessed more death and destruction in three months than it had suffered during the previous seven years. Sabra and Shatila, a Palestinian refugee camp on the outskirts of Beirut, marked the site of the Israeli-Palestinian and the internal Lebanese conflicts’ intersection. The front lines of these conflicts slashed through the refugee camps for three dark days and three eerily bright nights illuminated by flares that the surrounding Israeli army fired over the camps to assist their Lebanese client militia, the Phalange, in their gruesome tasks.